Located in the South-West of Germany at the foot of the Black Forest, Freiburg is one of the most beautiful cities in Germany and enjoys more sunny days than any other German city. With a population of 230,000, Freiburg is small enough to make you feel right at home from the first day and at the same time big enough to be lively and international. Apart from a mild climate and stunning scenery, locals and students alike appreciate its unique flair, its diverse cultural life and take advantage of its proximity to France and Switzerland. The city of Freiburg today sets itself high aims: it strives to strike a balance between ecology and economy, tries to provide cultural highlights in cooperation with its institutes of higher education and the university. Established in 1457, the University of Freiburg is one of the oldest German universities and is today one of the nation’s leading research and teaching institutions. The university has more than 24,000 students from over 100 countries enrolled in 180 degree programmes at 11 faculties. Global Health is the health of populations in a global context and transcends the perspectives and concerns of individual nations; it is about worldwide improvement of health, reduction of disparities, and protection against global threats that disregard national borders. Urban Health is the health challenges of the ever growing urban populations worldwide (1.02 billion people in 14 years with an upwards trend) including health risks from air and water pollution, noise, stress, the impact of violence, dissolving families, unhealthy food, reduced physical activities, overburdened health services with the double threat of communicable and non-communicable diseases, and many more. This modular course will be taught in English covering one full academic year. It is offered to graduate students worldwide with a minimum of four years fulltime higher education and at least one year of working experience. The MSc GUH course, which is hosted by the Faculty of Humanities and organised by the ZMG (Centre for Medicine and Society), is a full-time course with subsequent field study (for the M.Sc. thesis). 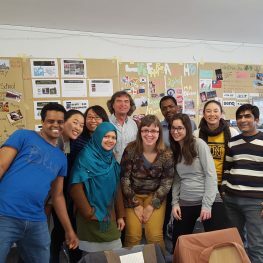 The master course includes interdisciplinary approaches with input from several faculties of the University of Freiburg and external lecturers. It offers excursions to WHO Geneva, relevant institutions in Basel and Strasbourg and is showing the efforts of the city of Freiburg to create healthy living conditions. The District of Freiburg Vauban is a good example of a green city district. The MSc Global Urban Health is intended for health and social science professionals with at least two years’ work experience. The programme will provide students with the tools required to take up management, policy, research or teaching positions at international, national or district level, in implementing agencies, academic institutions or NGOs. The Master of Science is open to professionals in health and social sciences, including economics, urban planning and others, holding a higher academic degree (minimum four years of academic full-time training). Proficiency in the English language is required: if an applicant is not a native English speaker, evidence of English proficiency is required (TOEFL or IELTS).